Scottsdale, AZ, August 15, 2018 – Inc. magazine today revealed that DEPCOM Power is No. 5 on its 37th annual Inc. 5000, the most prestigious ranking of the nation’s fastest-growing private companies. The list represents a unique look at the most successful companies within the American economy’s most dynamic segment—its independent businesses. Microsoft, Dell, Domino’s Pizza, Pandora, Timberland, LinkedIn, Yelp, Zillow, and many other well-known names gained their first national exposure as honorees on the Inc. 5000. “DEPCOM was founded in November 2013, and it’s a great honor to be recognized by Inc. as the 5th fastest growing company in the USA out of 5,000 other top U.S. independent companies. 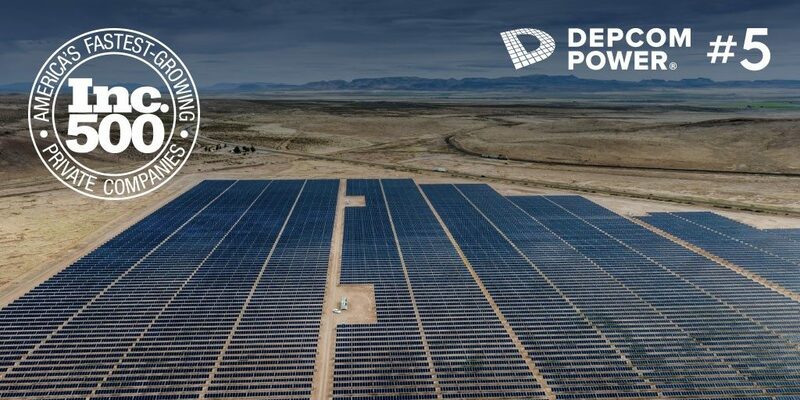 This achievement is truly a reflection of our strong team culture and unrelenting focus on driving customer, shareholder and employee value through excellence in process and execution,” said Jim Lamon – CEO, DEPCOM Power. Not only have the companies on the 2018 Inc. 5000 been very competitive within their markets, but the list as a whole shows staggering growth compared with prior lists. The 2018 Inc. 5000 achieved an astounding three-year average growth of 538.2 percent and a median rate of 171.8 percent. The Inc. 5000’s aggregate revenue was $206.1 billion in 2017, accounting for 664,095 jobs over the past three years. “Coupled with that, the dedication to our core company values, including hiring U.S. veterans, buying American-Made products and giving back to our local communities where we build, have undoubtedly helped fuel our reputation and growth, creating financial value for our families, communities, customers and valued investors. We feel privileged to be part of the great American dream,” said Lamon. Complete results of the Inc. 5000, including company profiles and an interactive database that can be sorted by industry, region, and other criteria, can be found at www.inc.com/inc5000. DEPCOM Power is also featured in the Top 500 companies list in the September issue of Inc., available on newsstands August 15.